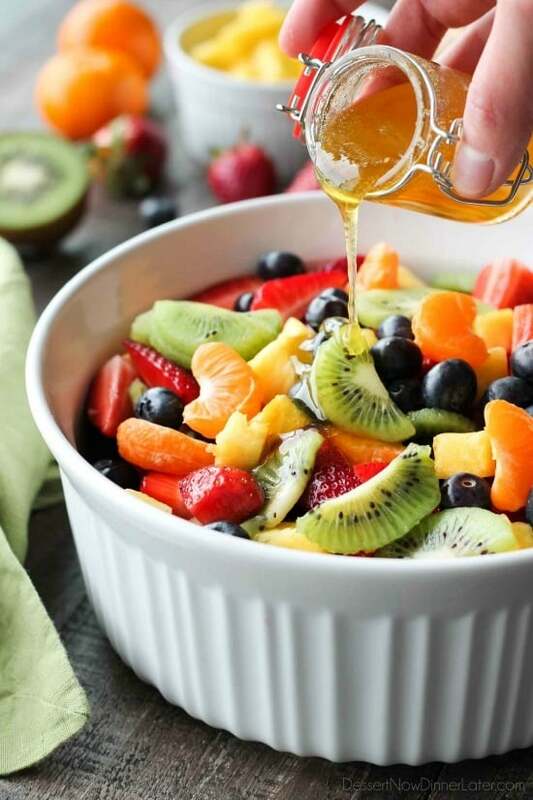 Fruit Salad with Honey Orange Glaze - Dessert Now, Dinner Later! 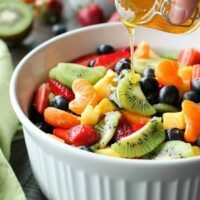 This summer fruit salad is as colorful as a rainbow, and is tossed in a reduced honey orange glaze for the perfect amount of added sweetness and flavor. Great for barbecues, potlucks, and picnics! 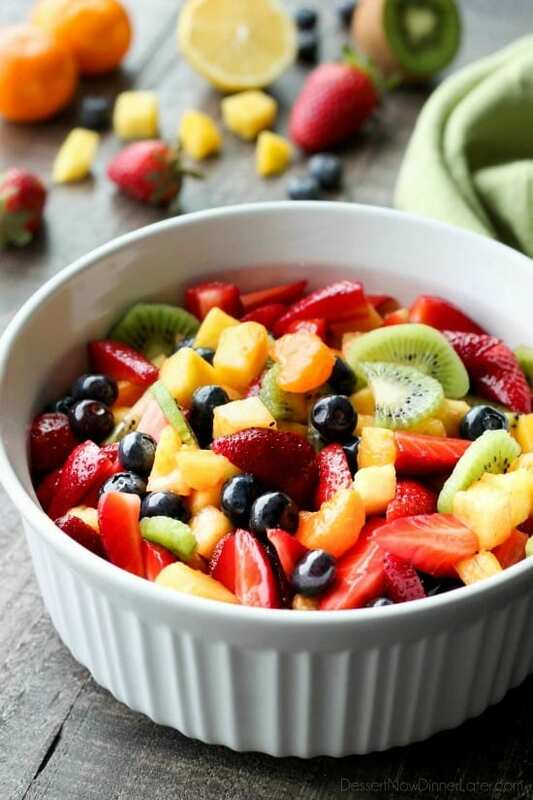 Summer is right around the corner and with it comes the most wonderful fruits, perfect for making fruit salad! I’ll be honest, I munch on pineapple year round. It’s my favorite because it’s so sweet, it’s like eating candy. I’m actually not sure when it’s in season exactly, because it always seems to be cheap and available in the stores where I live, but when the berries and kiwis start to go on sale, that gets me really excited! My family downed this salad in two days, which is saying a lot for a young family of five. Everyone had HUGE bowlfuls at each sitting. 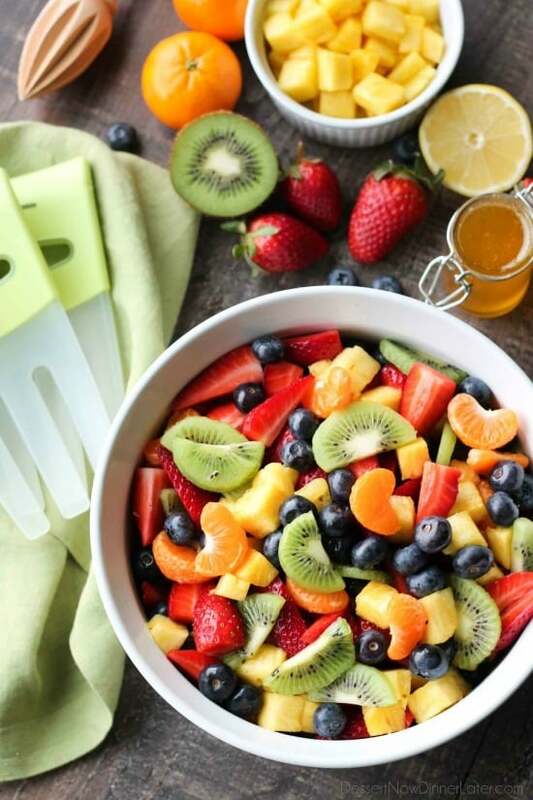 It’s hard to beat a fresh fruit salad, but the honey orange glaze on top, is the icing on the cake. It’s flavorful enough to take notice, but doesn’t overpower the natural flavors of the fruit. 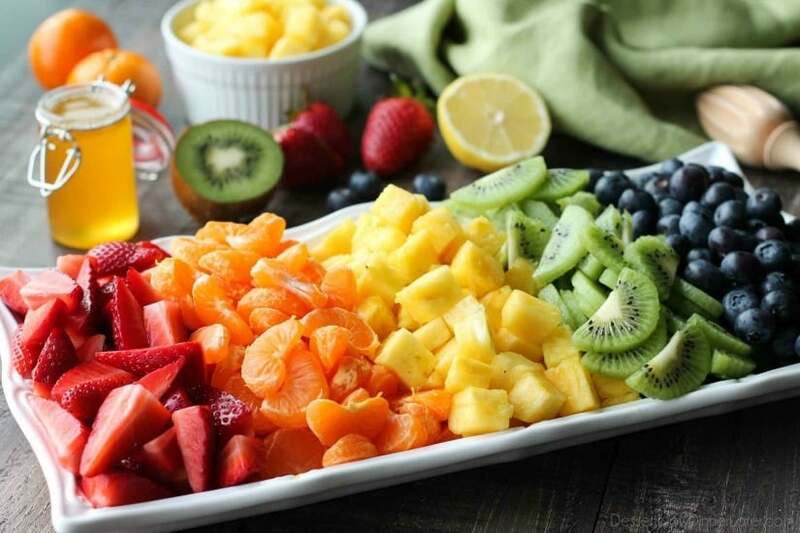 With any fruit salad, you want to be careful with the dressing, if you use one, because the fruits release liquid by themselves after they’re cut anyway. Adding straight juice (lemon, lime, etc) or other liquid to the fruit will just make it a watery mess. Because I boiled the glaze and reduced it down, it concentrates the flavors and makes the leftover fruit, significantly less soupy, leaving you with a natural syrup fruit cup. This salad is best eaten just after it is dressed for maximum flavor and crispness. 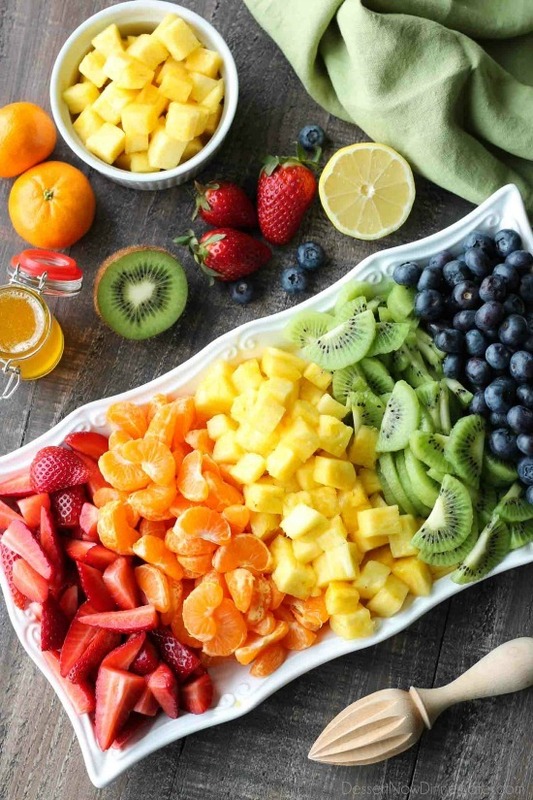 The fruit, especially the strawberries and kiwis, soften the next day, so try not to make this ahead of time if you can help it, and have lots of eaters ready! I just love all the colors, don’t you? Feel free to switch up the fruits. You can use anything in season. I used fresh mandarin oranges because there are still some on the shelves right now, but you can use canned mandarin oranges if you would like. They will break apart easier, so be gentle. Halved grapes would be good in this too. Have fun with it and enjoy! In a small saucepan, simmer the ingredients for the glaze (honey + juice) until thickened and reduced by half. BE CAREFUL! The glaze bubbles up and boils over easily. Keep an eye on it. COOL COMPLETELY. 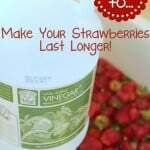 Hull the stems off the strawberries, then quarter (cut into 4 pieces). Place in a large bowl. Add the blueberries. Cube the pineapple. 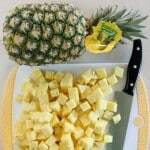 Cut the top and bottom off of the pineapple. Cut off the skin. Make four cuts around the core; then discard the core. Cut each piece in half width-wise first, then into 1-inch strips, and then into 1-inch chunks. (For a step-by-step tutorial, read this post.) Add pineapple to the bowl. 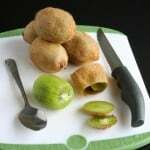 Cut off the ends of the kiwis, and peel the skin off with a spoon. (For a step-by-step tutorial, read this post.) Slice in half width wise, then cut into 1/4-inch slices. 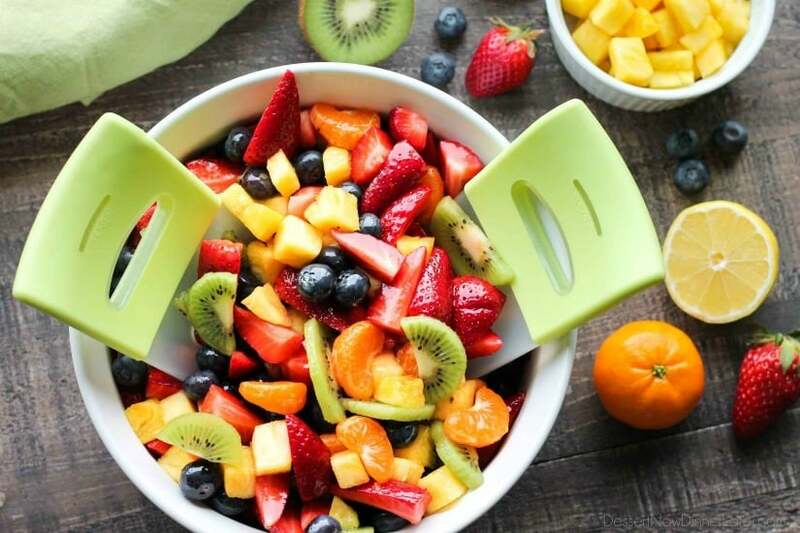 (TIP: Use an egg slicer for even cuts, but only with soft, ripe fruit.) Add kiwis to the bowl. Peel and segment mandarin oranges. Add to the bowl. When ready to serve, toss the fruit gently with the cooled glaze. Serve immediately. Refrigerate leftovers up to 3-4 days. *Feel free to use any citrus fruit juice for the glaze. All orange juice, all lemon juice, all lime juice, or a combination of any of these works great. This looks AMAZING! I love the colorfulness and the glaze sounds delish! 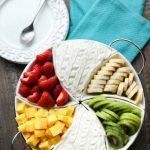 This is perfect for summer parties! Pinned! Thanks! And thanks for pinning!